Try this Brown Sugar and Honey Bacon Wrapped Pork Tenderloin for an easy-to-make dinner to impress! This post contains affiliate links for your convenience – see our Disclosure Statement for more information. On Christmas Eve, my fiance’s family gets together for dinner and gifts. For dinner, it’s turkey and ham with all the traditional sides. On the day after Christmas, we visit my family and have dinner there, which is also ham. That leaves me to figure out something other than ham or turkey to have for our own Christmas dinner. This is the second year in a row I’ve had to stray from my traditional turkey dinner and come up with something extra delicious for the special occasion. Last year, I made a beef tenderloin. It was so good and while one large tenderloin gave us two full dinners, our finances are a bit different this year. I opted to make a more wallet-friendly Brown Sugar and Honey Bacon Wrapped Pork Tenderloin! Let me tell you, it did not disappoint! I wanted to do something with the pork tenderloin that I hadn’t done before. 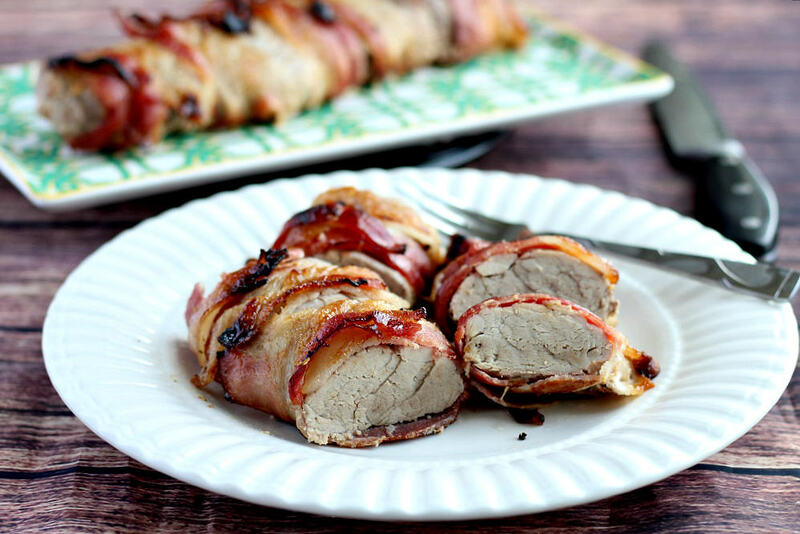 I knew I wanted to wrap the pork tenderloin in bacon (because everything is better with bacon, right?!). Of course, I browsed Pinterest first to see what else other people were adding to that. I saw a few recipes calling for brown sugar, and a few others using honey along with the bacon, but I decided that I was going to use both. I thought it might turn out too sweet, but that wasn’t the case. Now, when I make it, I add more brown sugar and honey on top too! Pork tenderloin usually comes in two pieces. Usually, one package of bacon will be enough to wrap both. This recipe is easier than you might think! All you need to do is get out your pan and all the necessary ingredients and preheat your oven. Lay half the bacon out on a broiler pan and place the pork tenderloin on top of it. Sprinkle on the brown sugar and drizzle on the honey. 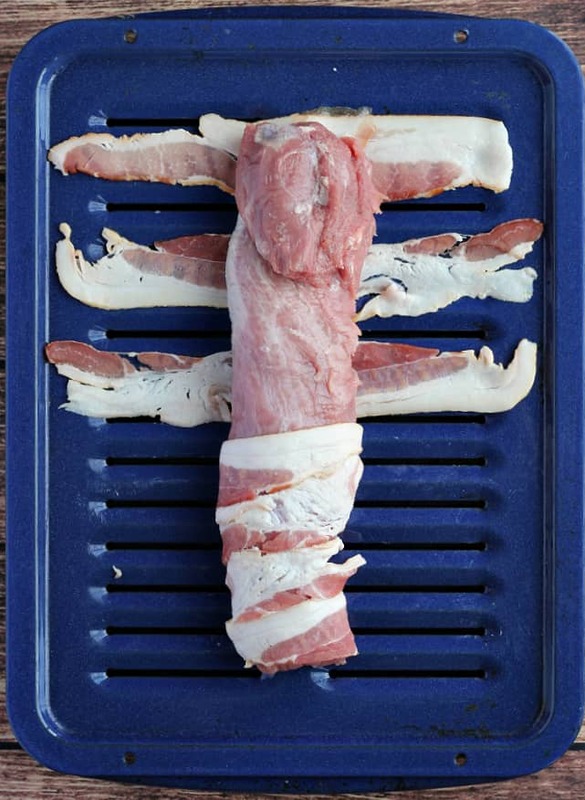 Wrap the bacon around the tenderloin until it’s completely wrapped in the bacon. If the bacon doesn’t quite make it all the way around, you may want to use toothpicks to hold it in place. You can sprinkle more brown sugar and honey on top. Repeat with the second half of bacon and remaining tenderloin. If you want the bottom pieces of the bacon to be crisp, you will need to brown just the bottom of the wrapped tenderloin in a pan before cooking in the oven. I have done it this way, and I’ve also skipped this part and think it’s just as delicious either way. 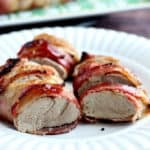 Cook the tenderloin in the oven for about 35-40 minutes until the internal temperature reaches 145 degrees F.
Once the pork tenderloin is fully cooked, I turn the broiler on for about 5 minutes to crisp up the bacon. This is easier than attempting to brown the entire bacon-wrapped tenderloin in a pan before putting it in the oven. If you don’t mind a little soft bacon on the bottom of your pork, this is definitely the way to go! Allow the pork to rest for 5-10 minutes before slicing so that the juices don’t run out all over. Set the slices out on a plate or pretty serving tray and serve! I always want to hear what you guys think! 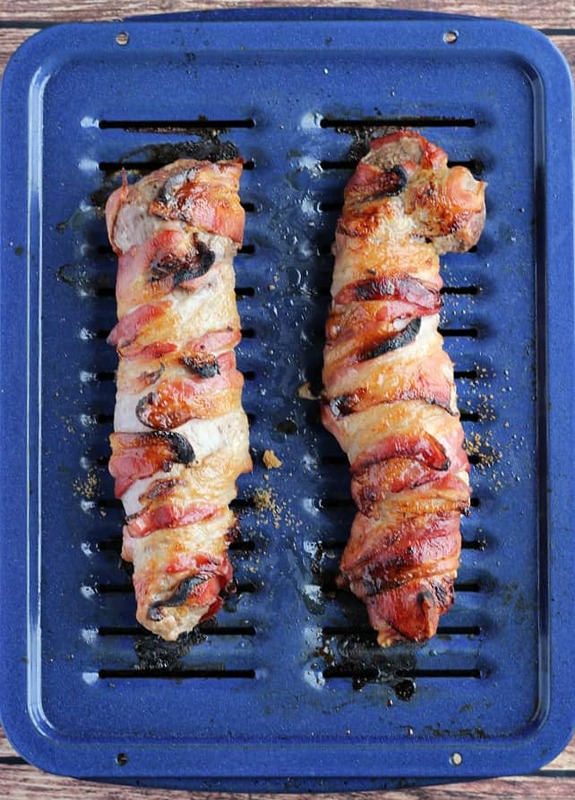 If you’ve made this Brown Sugar and Honey Bacon Wrapped Pork Tenderloin, leave a comment or send me a message anytime! Enjoy! Preheat oven to 350 degrees F. Trim the fat from the pork tenderloin. Brush on two Tablespoons of the honey and sprinkle on the brown sugar. Wrap the bacon around the tenderloin, using toothpicks to pin into place, if necessary. If you want the bottom portion of bacon browned, heat a large frying pan over medium heat and brown just the bottom of the pork tenderloin to get the bacon on the bottom a little crispy. Transfer to a roasting pan. Brush/drizzle on the remaining 2 Tablespoons of honey and sprinkle with more brown sugar if desired. Roast for approximately 35-40 minutes or until the internal temperature reaches 145 degrees F. At this point you can turn on your broiler for about 5 minutes until the bacon is browned and crisp, keeping a close eye on it the entire time to prevent burning. Let rest for 10 minutes before carving. Serve. Bacon does make everything better. This looks so good, tender and juicy. I love it. I agree bacon makes things better! This pork tenderloin recipe looks and sounds delicious, pretty easy too. Def one to try! Besides bacon, tenderloin is my favorite cut of pork! This looks delicious! I think this would be a great holiday option to add a tasty spin to pork! That looks very appetizing. I am sure it is loved recipe on your blog. Outrageous!! I am making this asap. We are always having pork and half the time I am so tied of cooking it I have NO ideas left. Thanks. Bacon is the ticket. Haha…bacon is almost always the ticket, isn’t it?? Hope you love it as much as we do! How long would you suggest you cook this if you want the tenderloin a little pinkish on the inside? My boyfriend prefers it that way but we either over due it or way under do it! this looks amazing, I have to try the recipe!!! Thanks Lorena! It’s one of my favorites! I’m SO glad you all loved it! Thank you so much for stopping by to let me know – I saw a lot of people coming to this recipe right before Christmas and was so nervous – haha! My mouth is watering reading this! Looks so good! Everything is better with bacon! My goodness does that pork tenderloin look good! You can’t go wrong with brown sugar and bacon! This recipe sounds so delicious! So true! Thank you Ryan! Pork wrapped in pork pretty much has to be good, especially when one of the porks are bacon. I can’t wait to give this a try it sounds delicious. Wow this looks absolutely incredible! I definitely need to get myself a pan like that too! Thank you so much, Justine! I think the title makes the recipe seem like it would be really sweet, but I agree….you can definitely get away with adding even more honey and brown sugar! I’m so glad you and your guests enjoy it! OH my goodness! I am so happy I found your recipe. Pinning for later!! 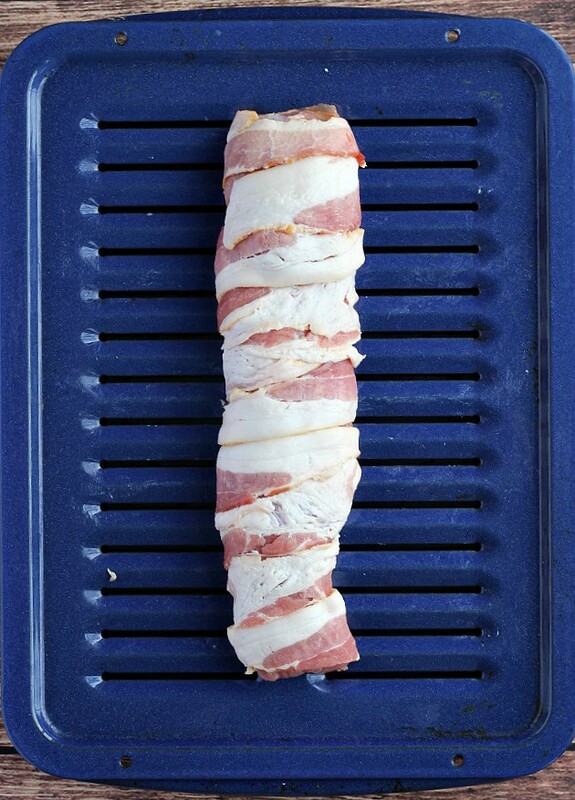 I love bacon-wrapped anything, but this looks amazing. I will definitely five this a try. 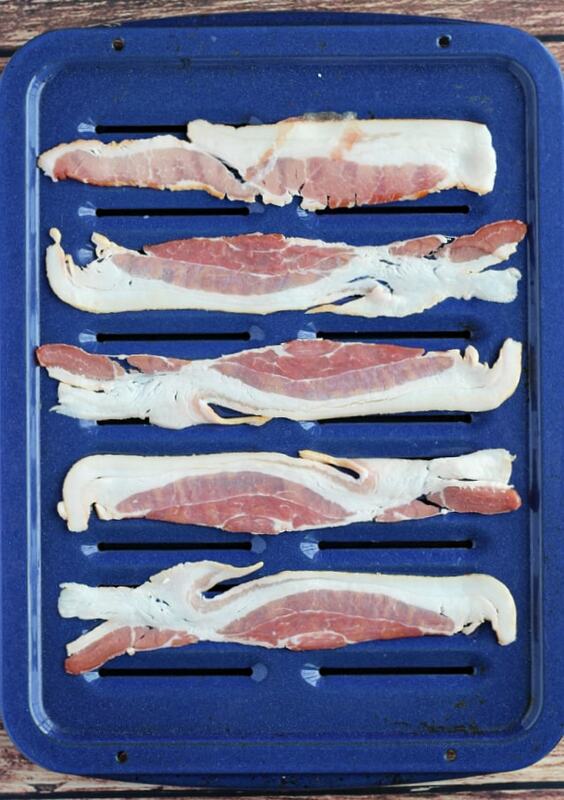 Thanks Donnica – Bacon really does make everything better! I saw pork tenderloin at the store for a good price yesterday and was just looking for something to do with it. My husband would love this! Thanks! This is great and my Marinated Cuban Pork recipe is good too! Well that looks amazing!! How can you go wrong with bacon and brown sugar!! Yum!! This pork recipe looks so good! Thank you for sharing, I can’t wait to try it! Haha it is a lot of bacon!! Yummy! Bacon makes everything better! This looks absolutely delicious! You have made me so hungry. I can’t wait to make this, this weekend! WOW!!! My hubby would love this! And it’s SO darn easy! Not too hard at all with the broiler! Oh, I think I have the exact correct wine to pair with this recipe… actually I have several candidates. Thanks for posting! This looks so good! Do you think you could do this on a smoker? I’m thinking the smokey flavor with the bacon would be unbelievable! Now this is a tenderloin my family would totally love. Bacon and brown sugar can’t go wrong.